Easy to pick up. Hard to put down. At 21 mm thin, the Inspiron 14z Ultrabook™ packs up to 3rd Gen Intel® Core™ i7 processor power into an ultramobile design. Power for your projects and passions. The Inspiron 14z Ultrabook™ proves you don't need to sacrifice power to get an ultrathin design. With up to 3rd Gen Intel® Core™ processor power, Windows 8 and up to 8GB* of memory, you get a perfect combination of portability and performance. Inspiron 14z is more than just a typical laptop. It's an Ultrabook™ — it's just 21 mm thin, super powerful, has long battery life and boots up in seconds. A built-in DVD drive makes Inspiron 14z a fully featured Ultrabook™. Massive appeal in an ultrathin package. With its elegant detail, brushed aluminum finish, durable construction and a thin design, the Inspiron™ 14z Ultrabook™ pairs the look you deserve with the sleek portability you demand. Always connected to friends and family. With the Inspiron 14z Ultrabook™, it’s easy to video chat with friends anytime and anywhere you have an internet connection. 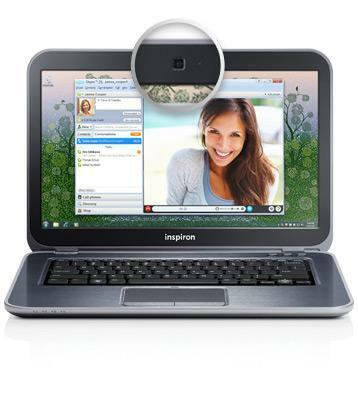 A built-in HD webcam and preinstalled Skype™ make it easy and fun. Your digital life, all in one place. Keep your music, videos, photos and more at your fingertips with Dell Stage software. With SyncUP powered by Nero, you can also enjoy the same content on your PC and smartphone.